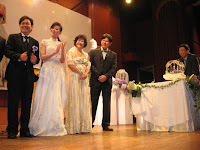 This report is with regards to Jason Geh’s Wedding Live Band featuring a remarkable female Wedding Singer performing at the Wedding Reception of Sean and Veyl Lee in Johor Bahru, Malaysia. Jason’s wedding band is currently base in Kuala Lumpur but they do travel outstation to perform on special request typically to Penang, Kota Bahru, Kuantan, Melaka and Johor Bahru. The wedding couple booked Jason’s band way in advance (June 2009 to be exact) to ensure availability on their wedding day (28th October 2009). 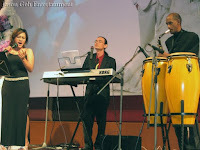 For this particular wedding event, Jason Geh’s live band comprise of a singer and two musicians. One of the musicians play the saxophone (and percussion) with Jason himself on vocals and keyboards. The size of the wedding band can be 2 piece, 3 piece, 4 piece, 5 piece or even larger with the inclusion of electric guitar, drummer or even an Er hu player to produce more depth and color to the overall sound of the band. But it all depends on the budget the client has available for an event. The client has the option to take the wedding live band packaged with the sound system included, at an affordable price. Note that most hotels in KL do not provide the sound system that supports external live bands but restaurants and outstation hotels are normally more accommodating on this area. 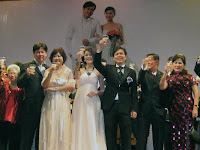 Sean and Veyl’s wedding reception was held at the Grand Straits Garden restaurant in Danga bay, JB, Malaysia. The couple were great hosts and graciously put the band up for the night at the new Grand Paragon hotel 20 minutes away from the venue. Congratulations to the newly weds! The photos and video on this website are specially dedicated to them. It's wonderful to find such a talented and brilliant musician in you! I've seen your blog and your website and I am in awe by how professional you and your team have looked and performed. You have provided an important ingredient to the start of every blissful marriage and making that event ever so memorable. Well done I say to you for what you have achieved over the years as a successful person!